Have your kids outgrown the swing set you just bought a couple of years ago? This is a problem every parent faces. As kids grow older, they need different toys. Toys that are appropriate for their age. It is the same with swing sets. Letting your child play on a swing set which was clearly meant for kids half their age is dangerous. You need to get them a set which is appropriate for them. But there are a ton of choices to choose from. From the $400 Walmart playsets to the $2000 swingsets you see on Amazon. they all look great. So how do you know which one is really worth your money? Today we’re going to look at some of the best swing sets for older kids for the money. Does your kid need a $10,000 swing with smart AI technology and seat warmers? Probably not. But they do need sturdy swings that can handle the kind of rough use an 8-year-old will deliver. This is why we have kept safety as our top priority when picking the best swing sets. If you are looking for more than a pair of swings hanging off a rod. Then the outing playset is a great option. This set is an entire playground wrapped up in a neat little bundle. I mean that literally. This set contains everything your kid will ever want in their backyard. Expect your backyard to be filled with kids from all over the neighborhood. Takes a ton of work to install( at least an entire weekend). As the product is made from wood it will begin to rot without proper care. The cool thing about the lifetime swing set is that it is unanchored so don’t need to cement it to the ground. This may not seem like a big deal as unanchored swings sets are pretty common. But sets like these are hardly ever as sturdy. What’s really impressive though is the effort taken by lifetime protect the set. In fact, every surface of the swing is powder coated for rust protection. The coating is then layered with a high-density polyethylene plastic which helps keep the swing cool even during the hottest summers. This set comes with a 5-year warranty so you know that it is not going to break down anytime soon. 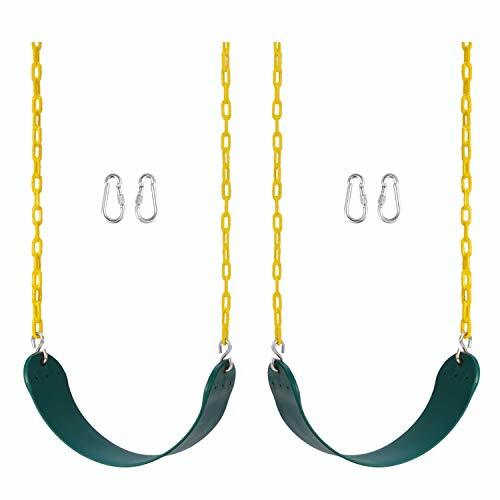 SWING SET ACCESSORIES: The Heavy-Duty Disc Swing is designed to be added to a swing set, jungle gym, or other outdoor playset. Your children will love this classic playset addition. OUTDOOR FUN: Swinging is the most popular activity for any outdoor playground or jungle gym! Complete or update your current backyard swing set with this Heavy-Duty Disc Swing from Squirrel Products. DURABLE AND DEPENDABLE: Made of high-quality materials to ensure hours of fun and years of play. Rated to hold up to 150 pounds. A swing seat for kids yet strong enough for adults! 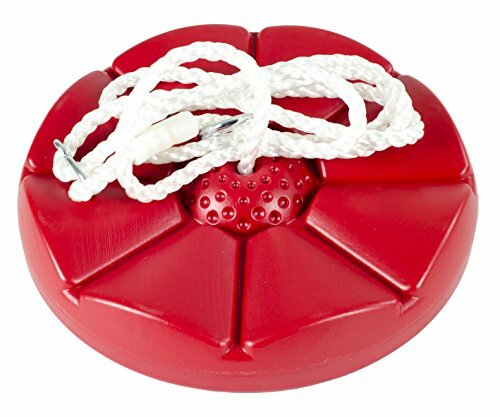 OUTSIDE ACTIVITIES MADE SIMPLE: Includes one disc swing seat attached to braided nylon rope with metal ring. Easy do it yourself installation for quick backyard fun. MADE WITH YOUR CHILD IN MIND: Our toys and sporting goods are modernized versions of popular, best selling classics, with improved safety and play functionality. The squirrel disk swing set is a cost-effective alternative to go for if you already have a sturdy tree in your backyard. This swing is extremely light and portable plus it hardly takes any time to set up – these features make it an awesome swing set to take camping or for a family picnic. All you need is a base to hang the set and you’re good to go. The seat is made from plastic and needs almost no of maintenance. It is not designed to handle the weight of an adult. 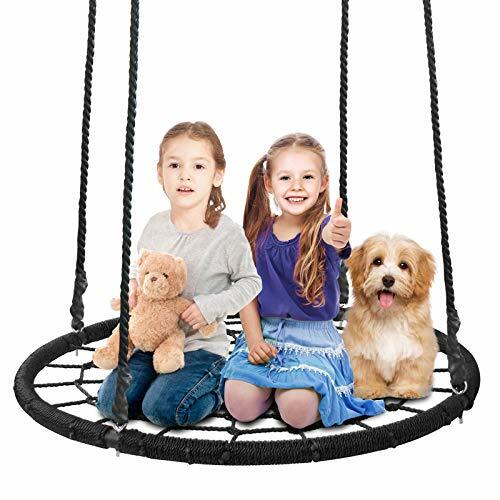 Whether you prefer to sit or stand, SUPER DEAL delightfully fun tree swing can support up to 600 pounds on a resilient nest of hand-braided spider webbing. It provides a roomy nest for a kid- and even a couple of friends - to lay back, sway, and spot cloud shapes. 100% safe and comfortable ride. This extra-large oval frame is made of sturdy steel wrapped in padding and durable braided plastic rope. Durable polypropylene rope creates a spider-web like netting with comfortable support. Unique polypropylene rope netting center builds core strength. Heavy-duty spider web design encourages imaginative play. The one-sheet metal frame holds as much as 660 lbs. The Round Web Tree Swing is 40'' diameter, which is large enough for multiple children to swing and play together - promoting teamwork and social skills, offering endless hours of fun. The best part for parents: You can assemble it with your kids in minutes! Super easy to install. The swing is designed to work universally and hangs almost anywhere from a sturdy tree branch to swing set. Our swing is resilient and resistant to all types of weather. Bring it to your next backyard party today. Collapsible design is convenient when going to the park, party, or relatives house and for storing during the rainy season. The spider web tree swing set has a beautiful weave like structure that grabs your attention the first time you see it. But once you look past its quirky design, you actually get a pretty durable and high-quality swing set the entire family can enjoy(not just the kids). The swing is durable enough for adults to enjoy but still entertaining for kids to play on. But the set does not come with a frame, you will have purchase this separately. Pro Tio: if you are going to be hanging it from a swing, you should get a swivel piece. This allows the swing to spin around freely. FULLY ASSEMBLED:Item comes fully assembled. FUN of hours of backyard family,perfect for both kids and adults. Setting up a swing set is a pain. Some sets even take an entire weekend to set up. Who has that kind of time? The carabiner heavy duty swing sets come fully installed. Just attach it to some support and it’s ready to be swung on. What I like about this set is that it does what it’s told and does not have a ton of extra accessories that plague most sets these days. If you’re looking for a good ol’ swing that’s extremely durable then the Jungle Kingdom swing set is a great option. These kinds of swings are much more constricting to sit on than a hard wooden plank style. Will my kids be safe on that swing? Will they find the set entertaining? What is the weight capacity of the swing set? This indicates how much weight the swing is guaranteed to handle. Manufacturers usually list this value along with the product dimensions. This value is generally lower than it’s actual capacity and your set should really be able to carry a lot more weight. However, this is not something to experiment with and it is better to stick to the provided capacities. Does the set need to be anchored to the ground? You need to know if your swing set will be anchored to the ground or not. An anchored swing is generally much more stable as it is held in place. But because the set is anchored to the ground you will not be able to move it once it is installed. Don’t like how it looks in your backyard? Too bad. That’s just how it’s going to be. Anchoring a swing set is also quite the task and while you can hire someone to do it. You can do yourself, even if you have no construction experience. Take a look at the dimensions of your swing set before you make the purchase. This way you can have a rough estimate of how much space it will occupy. There needs to be enough room around the swing so that kids can not only swing around the set but also jump off it(Which they will) without hitting something. 2 yards of space around the swing is a pretty good estimate and should give your kids enough free room to play as well. It is also better to keep a lookout for any hanging wires, shrubs or branches which could potentially be dangerous. Your child’s safety is extremely important and it is completely dependant on the materials used. This makes it super important to pick a durable material that will last for a really long time. Two of the most commonly used materials are metal and wood. Wood swings are much cheaper than metal but this affordability comes at a price(ironic). While wooden sets have a lower upfront cost, they require a lot more work to maintain. These days wooden sets are made from pressurized lumber which is then treated to protect it from rotting. But they are still no where as durable as metal swings. You need to set some time aside at the end of every year to preserve the wood. However, a wooden swing set has its own charm. Their rustic, natural look is ideal for any backyard while the mechanical metal set may feel out of place in your yard. You should go for a wooden swing set if a metal option is out of your budget or you are looking for a set that will look beautiful in your garden. 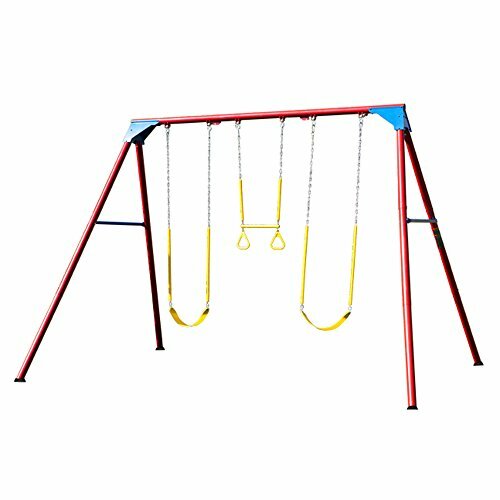 Metal swing sets are usually made from steel and last much longer than their wooden brothers. While a wooden set will show signs of age after a couple of years a metal swing set will look as good as new even after a decade. Although it might seem like a lot of work to keep a set in tip-top condition metal sets hardly need any maintenance. Most sets these days come with a powder coating which prevents rust and helps keep the swing set from getting too cold at night. Additionally, metal sets are stronger and have a much higher weight capacity than wood. However many people don’t find metal swing sets as pleasing to look at compared to wooden swing sets. If you are one of them then a metal swing set is probably not for you. You should spend more on your set if your kids are going to be spending all day on it. However, if you think the set is not going to get much use then it’s better to go for a more cost-effective alternative. Kids will get more use of a swing set with no playground nearby than one where you have a playground opposite your home. You also need to be prepared for your kid’s friends to swarm your home at every time they get the chance. Young boys tend to grow out of their swings sets the quickest. If you are looking for something your boys can play on for many years. I’d recommend you to get a basketball hoop. Kids often spend a large part of their teenage years shooting hoops on their backyard court. While setting the swing set up you want to avoid setting it too close to any trees and shrubs. Because of these reasons, it is best to avoid setting up your swing set on a hard surface like cement. Lifetime dominates the entire market for backyard products from basketball hoops to picnic tables to even swing sets and you get a 5 year warranty with every lifetime product. What’s not to love? Backyard Discovery specializes in creating wooden swing sets. In fact, for many years they were one of the only wooden swing set manufacturers in the US. These guys have been in business for the last 30 years and only sell through other retailers. In fact, they don’t even have a physical store anywhere in the US. The only way to get backyard discovery product is through wallmart or amazon. 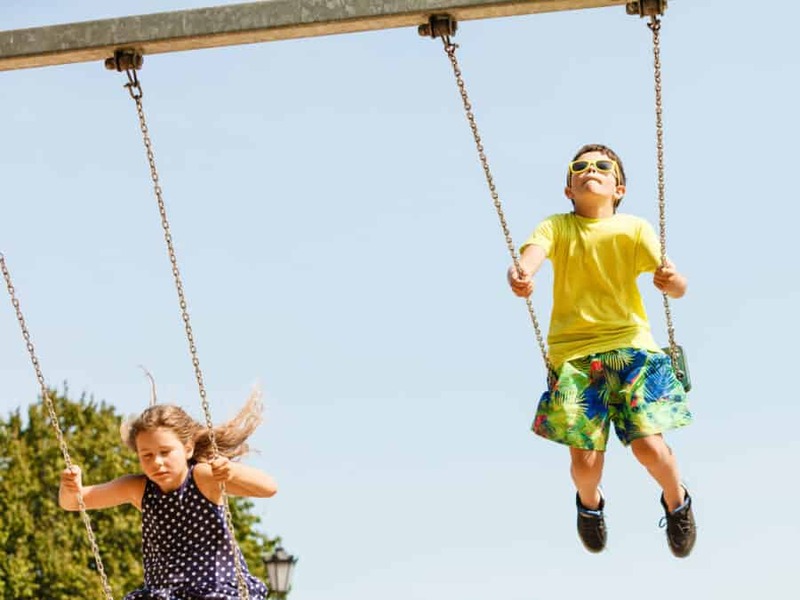 What is the difference between a swing set and a playset? A playset consists of more than just some swings. They contain things like a slide, monkey bars, and even a toy fort. 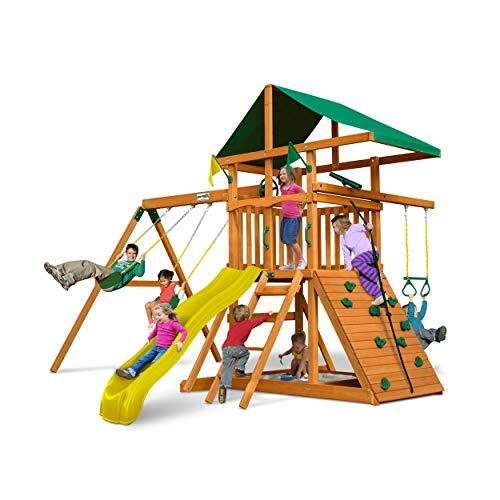 Playsets tend to cost a lot more than a swing set and will occupy a ton of space. If you are someone who doesn’t have an extremely large backyard or a huge budget to spend on a playset. You ought to get a swing set instead as a pretty viable alternative. I don’t have any decent trees in my yard that could hold a swing. What should I do? While most backyards use a tree as a swing support. This is not a solution everyone can use. Maybe you don’t have a tree or you don’t have one that is sturdy enough. Will getting a swing set destroy my garden? Garden dreams or a swing set for the kids? Most families believe they have to choose between the two. But it does not have to be like that. You can have a great garden and a swing for the kids as long as you are careful. Kids are extremely mischievous and they are likely going damage the garden. But having a garden is also a great way to teach responsibility. Give them ownership of the garden, show them that they are responsible for it and must be careful around it. You should also try to keep your garden as far away from the swings as possible but this may not always be an option. In this case, it is best to place the garden just behind the swings. This makes it unlikely that your kids might accidentally step on your plants. Should I go for a second-hand swing set? A second-hand swing set is a good option if you are looking for a high-quality swing. at a low price A great place to check out is craigslist and while there are a lot of scammers you can get a great deal if you really look for one. But I wouldn’t recommend getting a wooden set that is older than 1 year or so. This is especially true if you live in a damp area, as the wood warps. What this means is that when you try to re-assemble the pieces some parts of the set may not fit back together. Having a swing set is an essential part of any childhood. It’s also a great way to encourage your kids to go out and play. One of my favorite swing set for older kids is the Lifetime heavy duty A-frame. There’s no need to get a separate frame and it even comes with a lot of protective measures to keep your kids safe. But if you already have a frame from an older swing set or tree in a backyard that you would like to use. Then I’d urge you to get the Spider Web Tree Swing Set. The entire set is large enough for multiple kids and it can even hold an adult.